Says Vladimir Putin once said, "The breakup of the Soviet Union was the greatest geopolitical tragedy of the 20th century." By Katie Sanders on Thursday, March 6th, 2014 at 11:02 a.m.
John Bolton, a former U.S. representative to the United Nations, brought up an old quote from Russian President Vladimir Putin in an attempt to describe Putin's thinking. Russian President Vladimir Putin’s handling of the uprising in Ukraine is not surprising if you look at telling comments he made years ago, says former U.S. ambassador to the United Nations turned conservative television pundit John Bolton. A Fox News host asked Bolton if he agreed with Ukraine’s prime minister who said the country is "on the brink of disaster." Bolton, who served at the U.N. during George W. Bush’s time in the White House, said it seemed pretty accurate. "It’s clear he wants to re-establish Russian hegemony within the space of the former Soviet Union. Ukraine is the biggest prize, that’s what he’s after. The occupation of the Crimea is a step in that direction." We wanted to know if Bolton correctly characterized Putin’s comments. We reached out to Bolton through his political action committee and the American Enterprise Institute, where he is a senior fellow, but did not hear back. Putin, a veteran of the Soviet spy agency called the KGB, made the comments Bolton cites in an April 2005 state of the nation address to the country’s top politicians and parliament. A version is available in English from the Kremlin archives. Putin’s words vary depending on the translation, but the idea remains the same. "Above all, we should acknowledge that the collapse of the Soviet Union was a major geopolitical disaster of the century. As for the Russian nation, it became a genuine drama. Tens of millions of our co-citizens and co-patriots found themselves outside Russian territory. Moreover, the epidemic of disintegration infected Russia itself." The Associated Press translation is a little differently, subbing "catastrophe" for "disaster," and calling the breakup the "greateast geopolitical catastrophe of the century." That language is a little more in line with what Bolton said. Whatever the word choice, it’s clear Putin believed there were problems created by the breakup of the Soviet Union. Putin, who had revived some Soviet iconography as president, focused the rest of his speech on developing Russia as a free and democratic country, though he promised to be tough on popular uprisings inspired by surrounding countries. His speech came as President Bush and Secretary of State Condoleezza Rice offered public skepticism of the country’s "managed democracy," leading Putin to declare Russia would "independently determine" its definition of democracy. Still, it was his lament for the dissolved Soviet Union that dominated news coverage. The remark was alarming to westerners, illustrating a deep contrast in perspectives of an event that many consider a glorious moment in time, said Dina Spechler, an Indiana University associate professor of political science who teaches Soviet and Russian foreign policy. Spechler said she did not find a problem with Bolton’s characterization, though she added Putin does not want a return of Soviet-era economic centralization. "I think it’s quite legitimate and fair, and it’s been true for some time now that Putin wants to re-establish Russian hegemony," Spechler said. "He calls it an area of primary Russian interest -- making sure that these countries remain loyal." Spechler does not predict a full-scale escalation of force by Russia in Ukraine, she said, but she would not rule it out given the crisis between Russia and Georgia in 2008. Ukraine is a large country with strong cultural links to Russia looked upon as a Slavic brother, she said. "What we’re seeing today is the most significant step Russia has taken, and it is likely to take a while, to fulfill the agenda that was heralded when he called the breakup a tragedy," she said. The "upshot" of the speech was that if the greatest geopolitical tragedy was the breakup of the USSR, the greatest geopolitical achievement should be the reformulation of a Russian superstate, said Ariel Cohen, a senior research fellow in Russian and Eurasian studies at the Heritage Foundation. That’s not the only view of Putin’s remarks, however. Other scholars we consulted say there is more nuance in the meaning of Putin’s words. "Most references to this line have suggested that Putin was bemoaning the loss of the communist economic and political system," the book reads, "but Putin has since frequently underscored that he was talking about the collapse of the Russian state itself." Gaddy elaborated in an interview with PunditFact, saying Putin is not eager to re-establish the USSR, partly because it would be costly for Russia, which subsidized many Soviet countries during that era. He does, however, want to make sure surrounding countries are not used against Russia. Gaddy said Putin does not see Ukraine as a prize, as Bolton suggested, but as a potential liability and realm for anti-Russian activity. "His nightmare has long been that Ukrainian instability would be used to sap Russia’s attention and strength, or worse — that it would be used to entrap Russia into intervening militarily and getting bogged down," Gaddy said. "The nightmare is coming real." Lance Janda, chairman of Cameron University’s history and government department, challenged Bolton’s assertion that Putin’s remarks in years past foreshadowed the modern events in Ukraine. It’s more complicated, he said. Yes, Russia moved aggressively into Chechnya, South Ossetia and Crimea, but it was not on a whim -- it was to prevent instability along the border after years of NATO expansions, Janda said. Plus, Russia would not have worked in recent years to stabilize its dealings and cooperation with Western countries if it had planned to invade Ukraine all along, he said. "All Putin meant when he said in 2005 that the collapse of the Soviet Union was a catastrophe was that it launched protests and uprisings and sectarian violence, which is true," Janda said. "Those of us in the West are okay with that because we saw in those uprisings the birth of new nations and greater freedom, but that doesn’t mean it came without cost or that the Russians were thrilled by it." 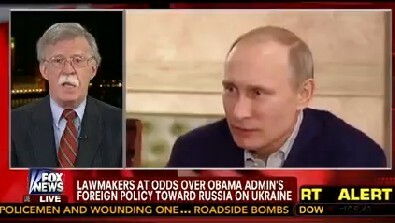 Bolton told a Fox News host that Putin once said, "The breakup of the Soviet Union was the greatest geopolitical tragedy of the 20th century." Putin did say those words, or at least words close to that, in a 2005 address to Russian political leaders. Bolton went on to tell a Fox News host those words are evidence Putin wants to expand Russia’s influence to where it was in the Soviet days. The record there is not as clear. We found some experts who agree with Bolton’s interpretation, while others who say Bolton is extracting a quote that does not quite mean what he says it does. Bolton’s statement is accurate but needs clarification. We rate it Mostly True. Published: Thursday, March 6th, 2014 at 11:02 a.m.